The Allen Brain Observatory presents its inaugural dataset, allowing for quantitative exploration of the functional properties that underlie coding of sensory stimuli through the visual pathway, at both the single-cell and population levels. The characterization of visually evoked cellular responses is carried out using in vivo calcium imaging from GCaMP6-expressing neurons measured from selected brain areas, cortical layers, and Cre lines. 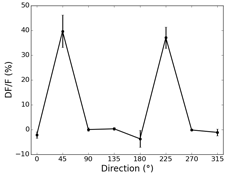 The cellular responses acquired during the presentation of the drifting grating stimulus provide data to help characterize visual tuning properties of cells, such as orientation tuning (a preference for a grating orientation), direction preference, and temporal frequency tuning (a preference for a specific temporal frequency). The drifting grating stimulus consists of a full-field sinusoidal grating that drifts in a direction perpendicular to the orientation of the grating. In this experiment, the grating drifts in one of eight directions, at 45° intervals, and at one of five temporal frequencies, ranging from 1 to 15 cycles per second, resulting in 40 distinct grating conditions. The presentation of the visual stimulus is as follows; a grating condition is presented for 2 seconds, and is followed by 1 second of mean luminance gray before the next grating condition is presented. Each of the 40 grating conditions is repeated 15 times, in a random order, and there are intermittent blank sweeps throughout the stimulus (i.e. the 2 second grating condition is replaced with 2 seconds of mean luminance gray). By comparing the responses to each of the 40 grating conditions, as measured by an increase in fluorescence due to increased calcium concentration, visual tuning properties such as orientation tuning, direction preference, and temporal frequency tuning are evaluated. 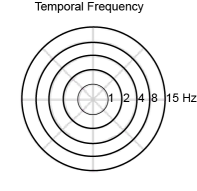 Typically, the orientation tuning would be represented by plotting the mean response (from 15 trials) to all eight directions at the preferred temporal frequency, while the temporal frequency tuning would be represented by plotting the mean response to all five temporal frequency conditions at the preferred grating direction. To simplify data visualization, the cellular response to the drifting grating stimulus is represented using the "Star" plot. Each arm of this figure represents a grating drift direction, while each ring represents the temporal frequency of the grating. 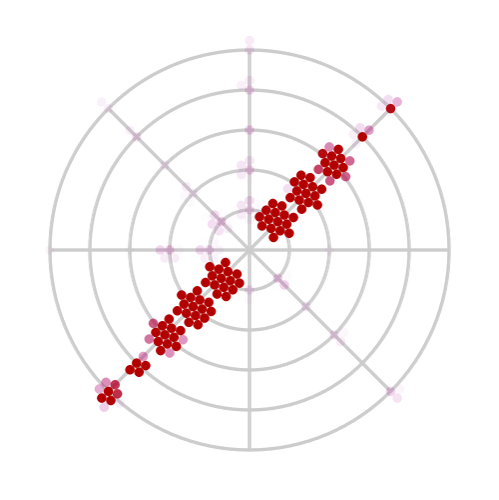 At each intersection, the responses from 15 trials are ranked, and represented as a single red dot, the intensity of which corresponds to the strength of the response. 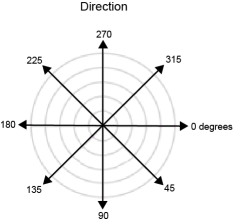 With this visualization, the orientation or direction tuning of a cell within a visual field can be quickly evaluated. 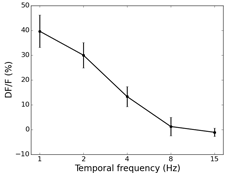 Likewise, the temporal frequency tuning can be evaluated by comparing the responses along one axis. Further, by comparing the fifteen trials across a given visual stimulus, trial-to-trial variability can be assessed.